I am an advanced beader and have loomed for over 40 years on tra­di­tional looms in which I must weave in each warp thread. I found this tedious and time con­sum­ing. It tended to leave some of my bead work very stiff. I gave up loom­ing for a few years until I dis­cov­ered the Ricks Loom. I found the loom easy to bead with and weav­ing in the two threads takes just min­utes com­pared to tra­di­tional looms. I am back to teach­ing loom­ing and get­ting more cre­ative in my designs. 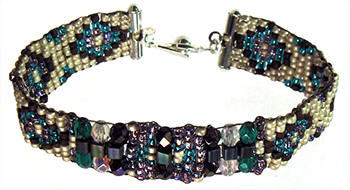 I love the Ricks Loom and highly rec­om­mend it to both begin­ners and expe­ri­enced bead loomers. Hav­ing used the Ricks Bead­ing Loom, I can say that it makes bead­ing on a loom a pleas­ant, quick and easy expe­ri­ence. No mat­ter what you choose to make on this loom, there will only ever be two warp threads to weave back in to your work, when you com­plete your project. The two small, cir­cu­lar mag­nets, fit­ted in one end of the loom is another very prac­ti­cal and wel­come addi­tion to the loom, as they give you an ideal place to store your nee­dle, when you may need both hands free to adjust your beads. I would rec­om­mend this loom to both begin­ners like me and those more expe­ri­enced with bead­ing on a loom. Who wouldn’t like only two warp threads left to weave in, no mat­ter what you make?